The next version adds a second CAN port and replaces the linear regulators with a 4 - 30 vdc input switcher and replaces the slide switch with a diode to auto switch to power from USB or external. 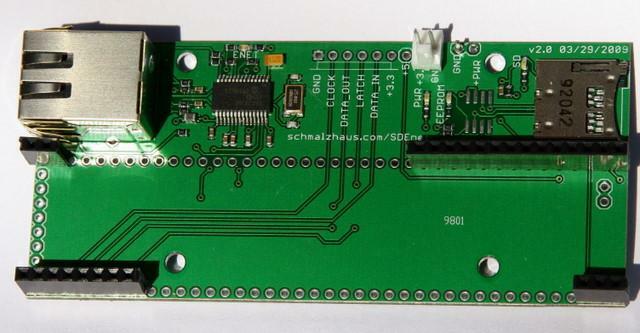 April 4, 2011 I made a new all on one board using the 32MX795F512L, I call the SDEnet6_v10.02. Ethernet, SD Card, CAN, 1 RS-232/RS-485, 5 RS-485, USB. There is a Boot Loader that loads from the SD card. Bi directional file transfer from a Web Site using only port 80. The software can be updated remotely from the web page. This the board I use for Elevate Live for Elevator Live monitoring and logging. I have PHP code serving the Web page this board calls to report the Elevator status. Microchip TCP/IP Stack 5.10 merged with the USB Stack. The TCP/IP Stack runs fine. I built the USB Stack with a CDC serial and SD Memory card combination device. They seem to work well together. USB 32-Bit Whacker from SparkFun based on the work of Brian Schmalz. Solder Paste from Wassco and the syringe pneumatic adapter and dispensing needles from Zephytronics. The parts were ordered from DigiKey and Spark Fun . I put down the solder paste and placed the parts ( technique learned by watching Mike Palazzola ). The assembled board was placed in the IR Reflow oven ( $40 toaster oven from WalMart ). 4 minutes at 200 F and then turn up the heat to max. It took about an aditional 1 minute 30 seconds for the solder to start to melt. Gently tap the toaster oven to cause the parts to settle on to the pads and surface tension lined them up. 30 seconds after the solder started to melt ( it went from dull gray paste to shiny solder color ) I turned off the heat and opened the door to let it cool down. 11/19/2009 Tested the first board. The first attempt produced a non functional board. 11/20/2009 Second attempt at building the board. I was much more careful on the second attempt and the board came right up. I found in the case of the SD Card socket and the .026 pitch ENC28J60 part I could apply the solder paste to the parts, clean off the excess paste shorting the pins and then ever so carefully lower the parts onto the board. It took a few tries of lowering the parts, moving a bit and smearing the solder, cleaning it all off and trying again before the parts went down clean. The first try I ran a bead of solder across all the pins of the ENC28J60 SSOP and tried solder wick to remove the shorts after soldering, the board drew too much current.